Predator or prey? 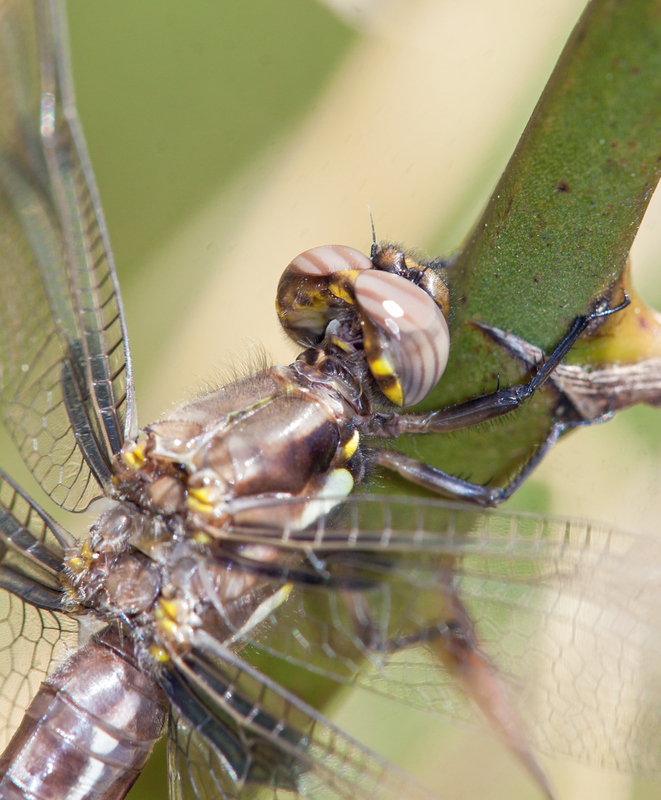 Dragonflies are fearsome predators, but they can also become prey—it’s the whole circle of life cycle in the natural world. This past Friday as I was walking around Occoquan Bay National Wildlife Refuge, I spotted the twisted body of a dragonfly suspended in the air against a backdrop of the sky. Instinctively I knew that there must be a spider web there, although it was not initially visible. 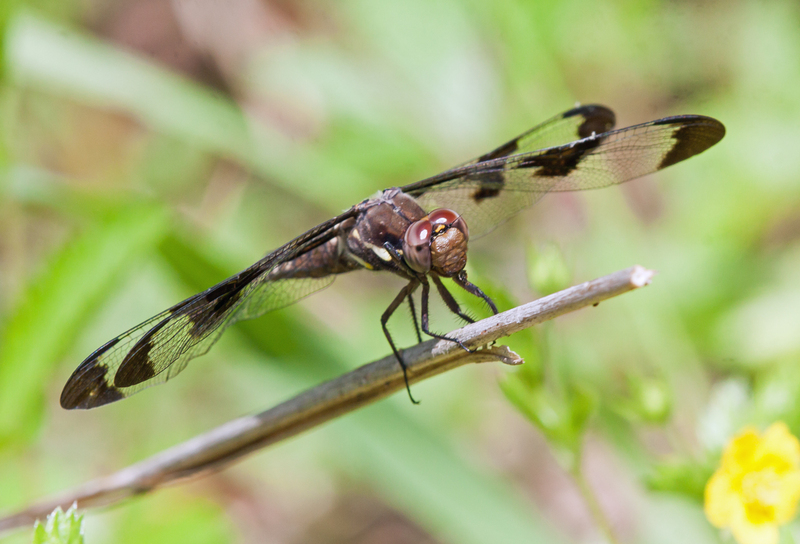 The wing pattern of the dragonfly made it easy to identify as a Common Whitetail (Plathemis lydia). 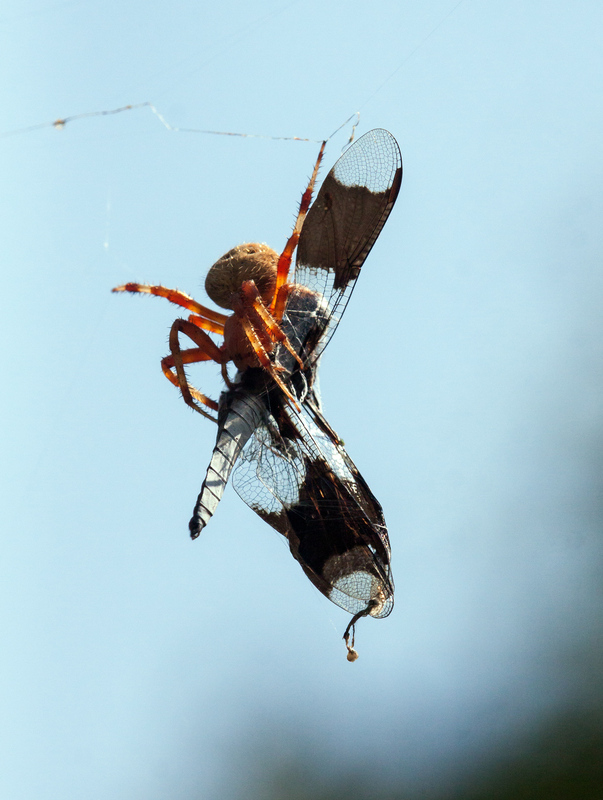 As I got closer, I realized that a large spider was holding onto the body of the dragonfly. I am not totally certain of the spider identification, but it looks to me like it is a Spotted Orbweaver (Neoscona crucifera). Often when I approach a spider, it will scurry to the edge of its web, but this spider defiantly stayed in place—it looked like it was determined not to give up its prey. 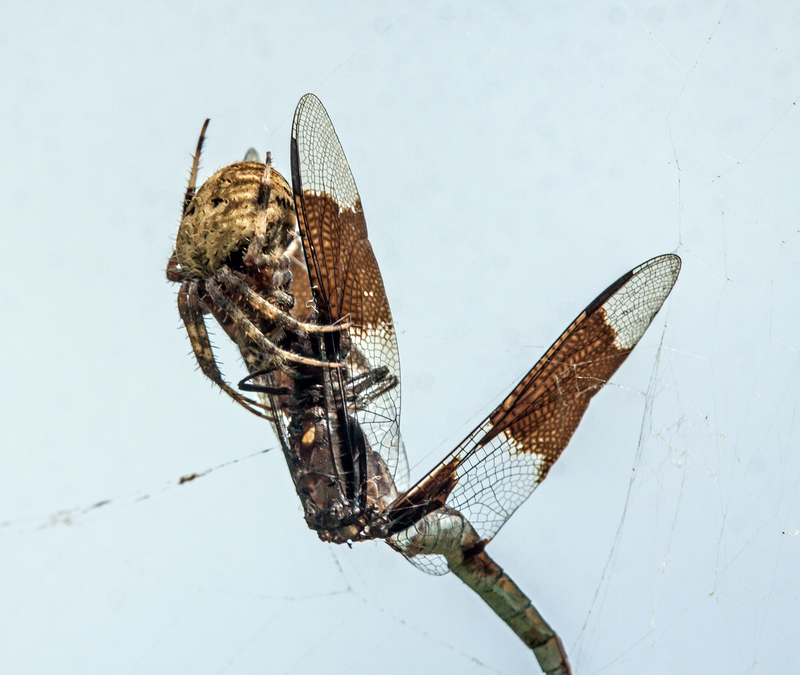 As many readers know, I really like dragonflies, but spiders have to eat too. Undoubtedly this scenario plays out multiple times each day, but it is still a little unsettling to see it face-to-face. 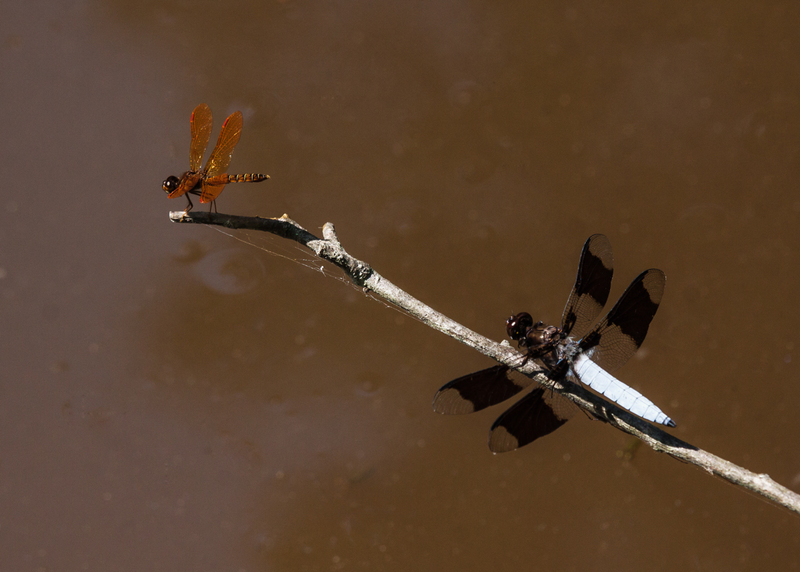 Despite their differences in size and appearance, the Eastern Amberwing (Perithemis tenera) and the Common Whitetail (Plathemis lydia) dragonflies were able to co-exist peacefully and both were able to enjoy the same perch this morning at Huntley Meadows Park. 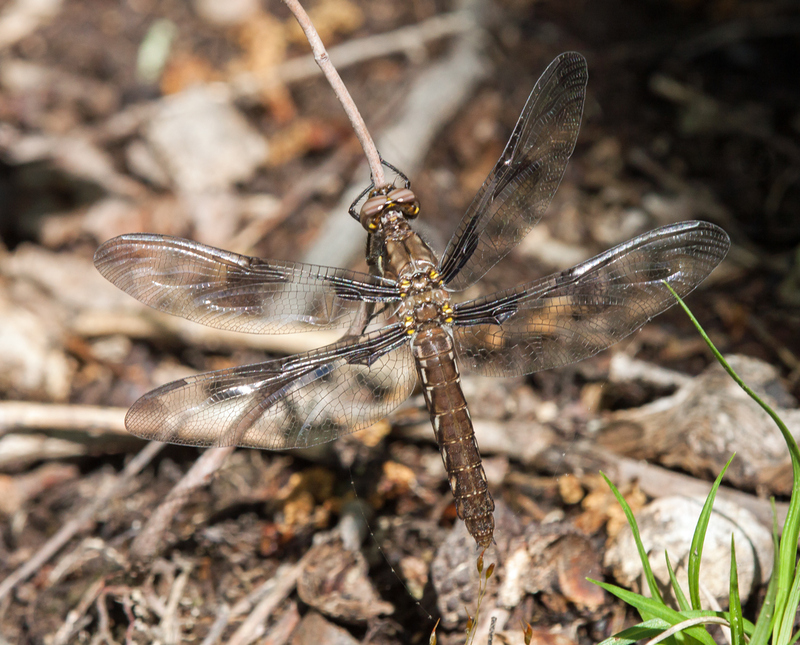 Occasionally I complain that some species with names that include “common” are rare, but Common Whitetail dragonflies (Plathemis lydia) are in fact quite common. 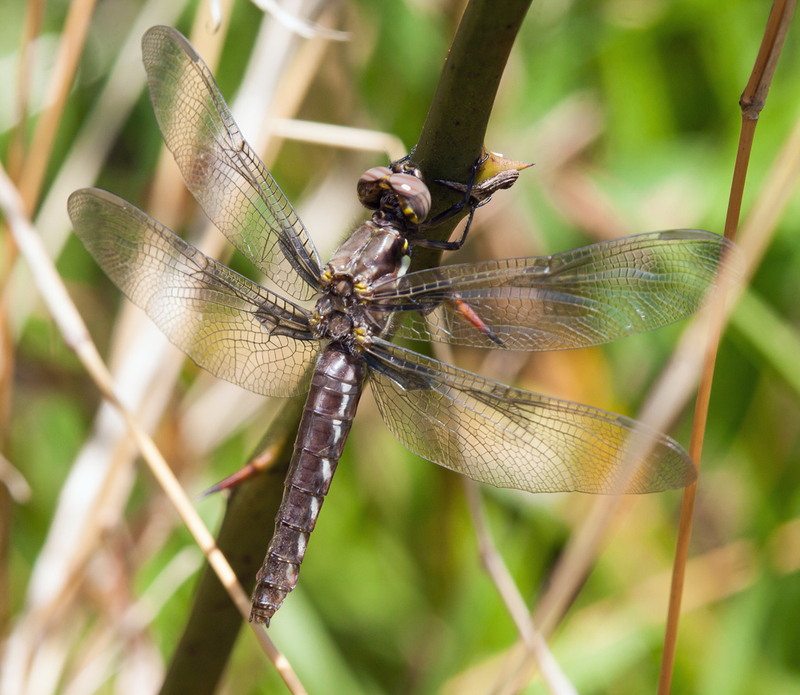 They are among the first dragonflies to appear in the spring and among the last to disappear in the autumn. 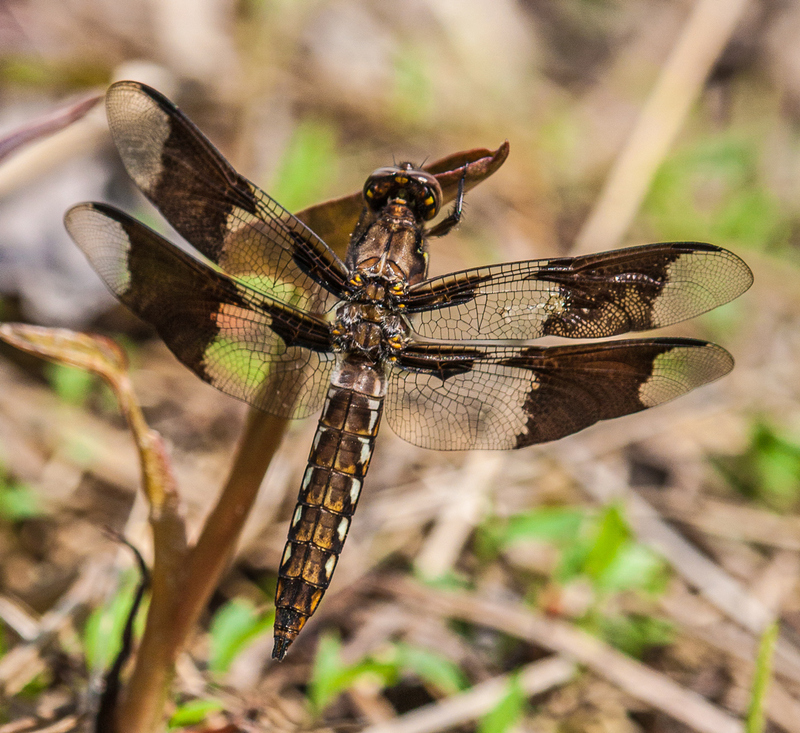 Even though I see them all of the time, I’ll frequently photograph Common Whitetails, with the hope of capturing a new or different view of the dragonfly. Yesterday was sunny and I knew that I would have trouble photographing male Common Whitetails, because their bodies are so white. Usually they end up overexposed with the highlights blown out. To try to compensate for that problem, I set the metering mode on my camera for spot metering and I was able to capture this shot. 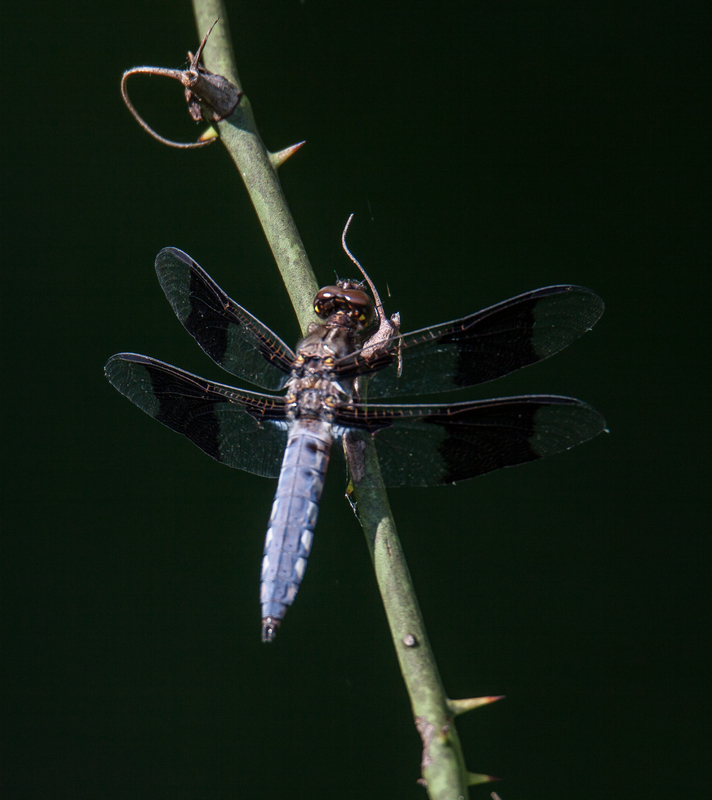 The dragonfly is a male, but has not yet acquired the bright white of an adult male, which made things a little easier. I managed to get a proper exposure for the body and the rest of the image is a bit underexposed. The result was a kind of dramatic lighting effect that helps me to highlight the uncommon beauty of this common species. 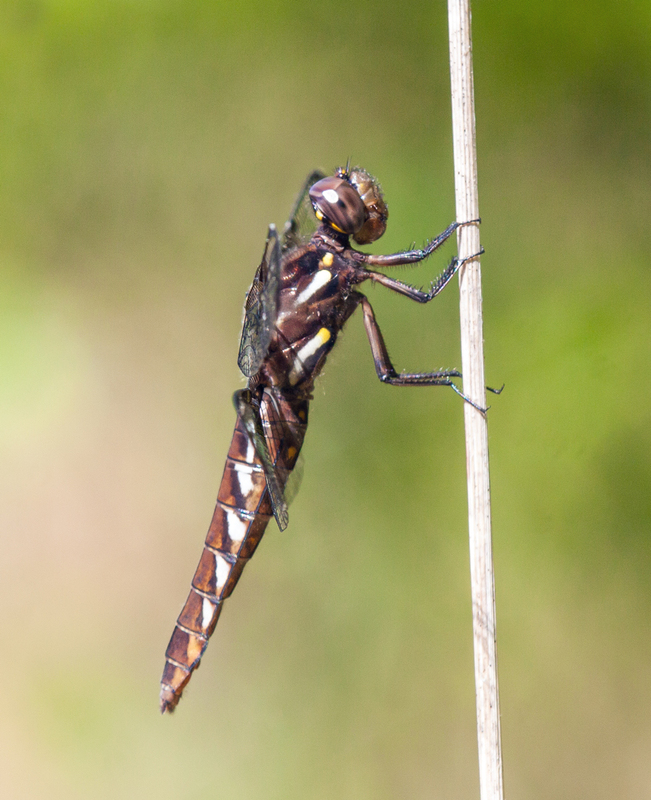 Most dragonflies like sunshine, so it’s been tough this month to find very many of them, given the almost constant cloud cover and frequent rain showers. 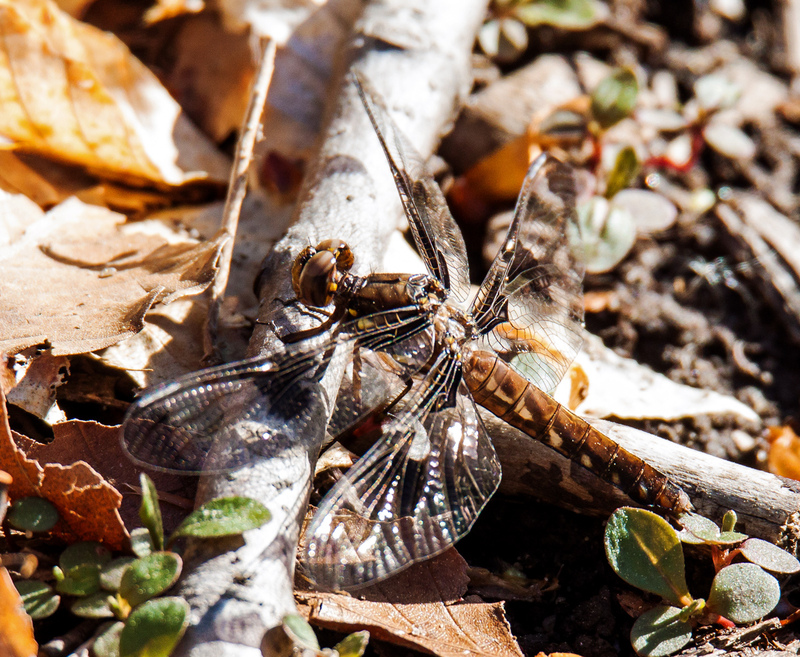 Here are a few shots nevertheless of female Common Whitetail dragonflies (Plathemis lydia) from earlier in May. All of them appear to be young ones, in particular the one in the final shot, whose wings have not yet acquired their final coloration, indicating that it has only recently emerged.